to form one EXTRA long caterpillar display! 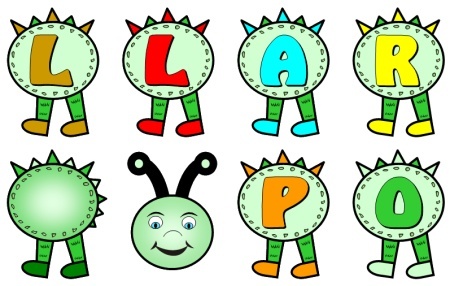 These 2 long caterpillar banners are included for free in this set of poetry lesson plans. 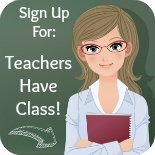 These poetry lesson plans will be emailed to you and then you can download them instantly. 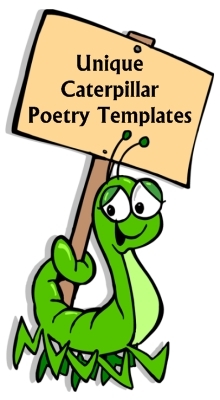 If you have 25 students in your classroom, you can create a caterpillar poetry display that is over 15 feet long with this unique set of poetry lesson plans. These caterpillar poems are ideal to use along with your science curriculum and the life cycle of caterpillars. If you are reading a book with a caterpillar theme, such as The Very Hungry Caterpillar, these poetry lesson plans would be a wonderful resource to include along with the book that you are reading to your students. I am sure that you will be able to think of additional ideas that are specific to your particular curriculum where these caterpillar poems would be a fun creative writing activity to include in your lesson plan activities. 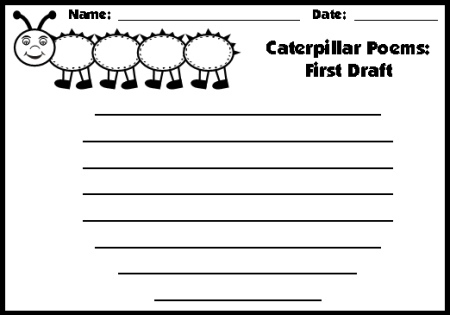 For these poetry lesson plans, each student will write a poem about caterpillars in one caterpillar template. Students cut out their caterpillar templates and then color them. Along with the head and tail template, you will glue all of your students' caterpillar templates together to form one EXTRA long caterpillar poetry display that will look dynamic in your classroom. can be displayed in a straight line. poetry display weave up and down as if it is crawling. glued together, plus the head and tail of the caterpillar. Your caterpillar display will be much longer than the examples above. caterpillar display will be 5 times as long as these examples! 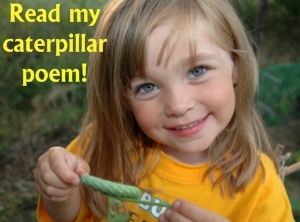 Everything that you need to complete these caterpillar poetry projects is included in this set of teaching resources. All that you will need is scissors, coloring pencils, and glue. For creative writing assignments, I believe that it is important for students to go through the steps of the writing process. My students begin this poetry assignment by using the first draft worksheets that are included in this set of teaching resources. Then, they edit and revise their caterpillar poems on their own, with a partner, or in individual writing conferences with me. Below is an example of the first draft worksheet that is included in this set of poetry teaching resources. 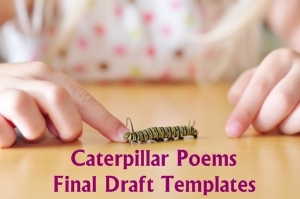 After students have edited and revised the first drafts of their caterpillar poems, you should give them their final draft caterpillar templates. 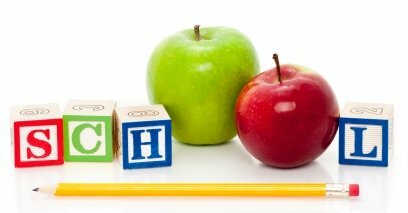 The middle caterpillar writing template measures approximately 9 inches in length and 7 inches in width. If you assemble 10 students' caterpillar poems together (along with the head and tail templates), the caterpillar will measure about 7 feet in length. If you have a class of 25 students, your caterpillar classroom display will be over 15 feet in length. These caterpillar templates have thick borders, so it is easy for the students to cut out their caterpillar templates themselves. 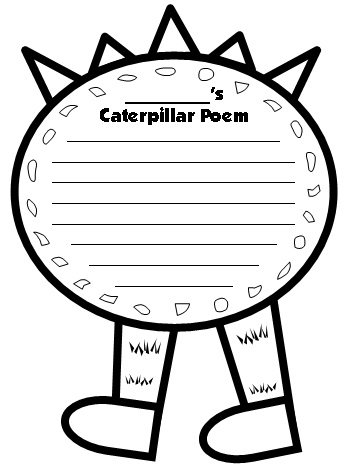 Each student writes his or her poem in a middle caterpillar template. Along with the head and tail templates, you will then assemble all of the caterpillar templates together to make one EXTRA long caterpillar poetry display for your classroom that contains a middle section completed by each of your students. As I am introducing this poetry assignment to my students, I like to begin by sharing my caterpillar poem with my students. At the front of my classroom, I display an example of what the final draft caterpillar templates look like. By providing a visual example at the very beginning of this lesson activity, my students know what their poetry assignments will look like when they have completed their final drafts. 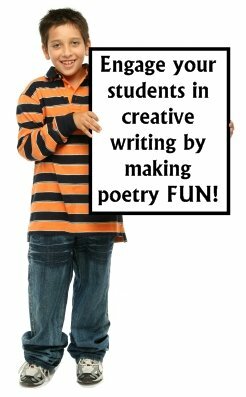 When I give my students fun poetry templates to write on, I have found that they tend to use their best effort and they are more careful to not make careless errors. 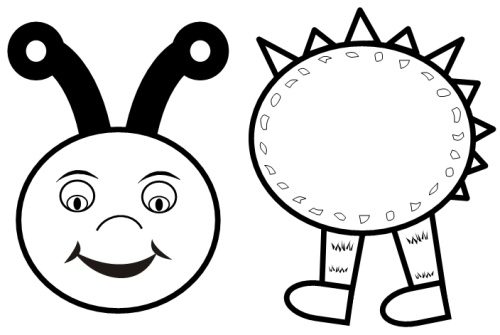 I have included color caterpillar poetry templates for you to use as a visual example to share with your students, and so that you don't have to spend time coloring these caterpillar templates yourself. There is also a color caterpillar speech bubble included in this set of poetry teaching resources. 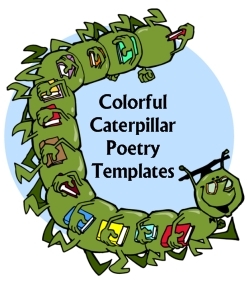 There are 8 different colors of caterpillar templates (center section) provided in this set of poetry lesson plans: red, blue, yellow, orange, green, pink, purple, and brown. 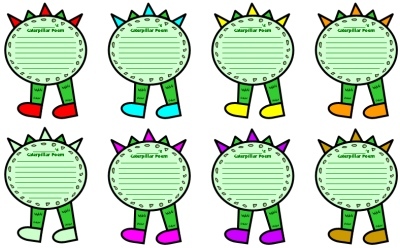 You can print out multiple copies of these 8 colorful caterpillar templates and give them to your students to write their poems on instead of the black and white templates. 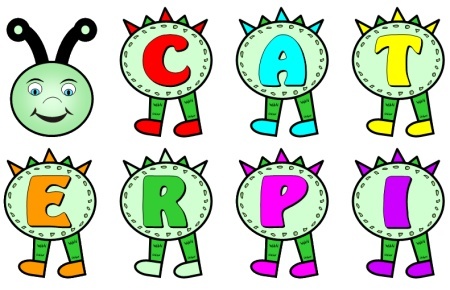 If you choose to use the color caterpillar templates, your bulletin board display of your students' caterpillar poems will be an bright array of rainbow colors. 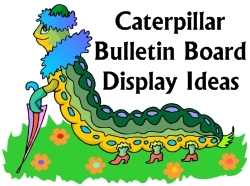 Your colorful caterpillar poetry classroom display will be sure to capture everyone's attention! This time is valuable and better spent on developing your classroom curriculum and grading papers, so I have included a matching 5 page banner for your caterpillar poetry bulletin board display. 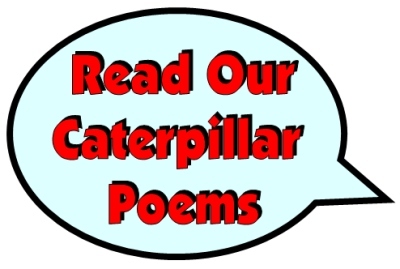 If you have access to a laminating machine, you can laminate your banner so that it is durable and you can use it year after year for bulletin board displays of these caterpillar poems. I have also created a caterpillar shaped title display for you to use. There is one letter inside each section of the caterpillar's body to spell out the words "Caterpillar Poems." 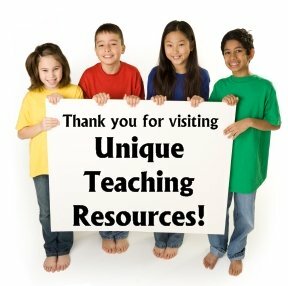 By using this uniquely shaped title display, which matches the student writing templates, you will be able to create an eye catching bulletin board display of your students' poetry assignments. 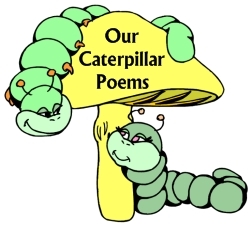 Thank you for visiting my Caterpillar Poems Teaching Resources page.